The Mega Millions and Powerball mascots frolicked in Denver's Confluence Park on Tuesday, reminding passers-by about the huge jackpots up for grabs this week. Our Lottery mascots were all abuzz with excitement and hope for a big Colorado winner this week. Tuesday was the night of a historic $1.6 billion jackpot Mega Millions drawing and they wanted to remind players to get their tickets no later than 7:30 pm. 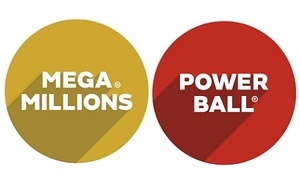 A $620 million Powerball jackpot for Wednesday night is the 3rd-largest in that game's history. Tuesday's Mega Millions jackpot caused quite the buzz nationwide, and although Colorado did not win the grand prize, we say Congratulations to the lucky winner in South Carolina! Seven Colorado players were just ONE number away from hitting the huge jackpot. Also, forty Colorado players won $1,500 so please everyone - check you tickets!